(September 29th, 2016) Hollywood Director Fred Olen Ray has wrapped his 4th feature film shot in Western New York. Following the success of “A Prince for Christmas”, “Mother’s Revenge”, and “The Apprentice”, Ray came back for more of what he feels is the best array of locations anywhere outside of Hollywood. Jordan Ladd (on couch) gets ready for a scene shot in a downtown Buffalo office. 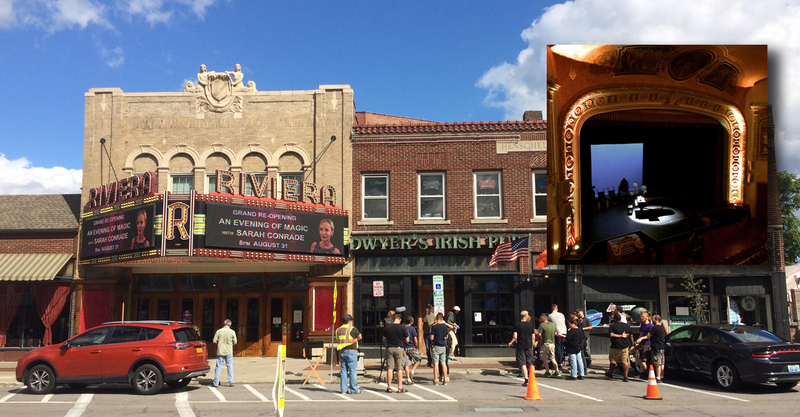 For “Curtains” starring Jordan Ladd (Cabin Fever), Brody Hutzler (Days of Our Lives) and Bob Rusch (Sons of Anarchy), Ray chose North Tonawanda’s Riviera Theatre as the main setting for this thriller about a retired opera singer who receives some unwanted attention. Curtains shoots in the Colonel Ward Pumping Station. Other locations featured include the Lockport Cave, the Barton Mansion in Lewiston, and the Colonel Ward Pumping Station. Look for a spring 2017 release on a screen near you.